This app lets you carry out simple C programming notes with your Android device. It has a simple UI with contents users can understand easily. It contains categorized questions and answers, over 100 C programs with comments, chapter wise complete C tutorials, key exam questions, and other relevant features. This app is a hot cake right now. You have the opportunity to experience one of today’s most programming languages on-the-go, while playing, without paying a dime. You also get to face off and cooperate with fellow SoloLearners, while checking out brief lessons and engaging quizzes. Practice that has to do with writing Python code is bliss with this app. Users also collect points, and they flaunt their skillset. This one was developed for the theory on “interactive textbook of Internet technologies.” It comes with a list of every element used in HTML 5 Explanation. There are more than 30 programming languages to be messed with here. Interview questions for programming jobs are also present. HTML5 tools are discussed as well plus a utterly customizable app in its settings. You are allowed to write code on your mobile device or tab, with great ways to learn system anywhere. HTML and CSS can be mastered with this app. Newbies just moving into the world of code should appreciate everything about this app. This is a very apt way to gain knowledge of technology. You can grasp the understanding of HTML & CSS through coding Android apps with Java and iPhone apps with Swift & Objective-C. There are more than 1000 videos on it, created by professionals in the coding industry, lecturing you on web design, coding and the business that comes with it. There are also quizzes you can use to test yourself. You gain access to over 1,000 courses and Specializations developed by 140+ of the very best schools and universities worldwide. 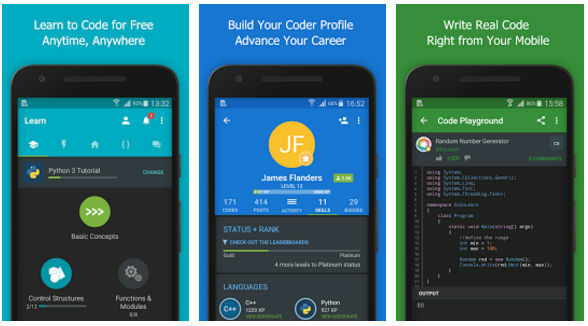 With this app, you can elevate your career or further your education by getting familiar with subjects on Python programming and the rest. You can stream lecture videos online plus the seamless switch from web to app learning is quite apt. If what you plan to do is learn HTML and CSS then this app should be the one you decide on. It is an excellent app for almost everybody. You can be a complete beginner, designer, fulltime developer to take advantage of what Code Hub offers. It has 50 lessons with four chapters that discuss all things Web, HTML5, and CSS3. Code Hub is multilingual – it learns HTML, CSS In English & Hindi. It works offline as well even you’ll require the Chrome browser. Must Read: Do You Really Need a CMS To Build a Website? There you have it. You have just been served with the best coding apps for Android. You can go on an unleash the programmer in you.